All festivals are different, even the same event from year to year. Each festival has its own personality reflected in the demographics of those attending and, particularly whether or not the event serves or allows beer. Every festival has its own story. Below are some of my thoughts and observations about festivals I have attended over the past 40 years. I hope you find them interesting and possibly useful. Although it was not the first bluegrass festival I ever attended, Gettysburg was the first bluegrass festival I ever attended with my family. 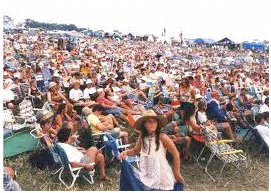 It is perhaps the best place for your first bluegrass festival. The size of the event is small enough to really enjoy. The record attendance is just bit over 3,000. The fairly large lineup usually is very good with both straight ahead and modern bluegrass bands. Joe and Lil Cornett, the campground owners, and now their children, Rich & Cyndie Winkelmann, have done a terrific job developing Granite Hill Campground which hosts two bluegrass festivals each year. This is one of the few festivals we have attended to have two heated shower/bathroom/laundry facilities and a convenience store. Recently, the campground built a new large stage and stopped using a small portable stage that had been used for many years. Many call it the stage that Alison Krauss built because the overflow crowd she drew in the first year of the new facility probably paid for the new stage. There was a traveling CD store that always set up at the Granite Hill main building under the porch roof. Charlie Chase and his wife had the most complete collection of Americana music that we had ever seen. I always enjoyed perusing the bins and always saw albums I didn’t know existed by artists that I loved. The folks at this event make sure the bluegrass festival camping experience is great. Seating rules allow everyone to place their lawn chair in front of the stage and leave it there for the entire weekend. Anytime your chairs are unoccupied others are allowed to use them until you return. I really like this approach to seating. I wish more festivals used this seating model. Of course there is a broad spectrum of people who come to Gettysburg for the bluegrass. The crowd can be generally divided into two groups. The larger group is primarily older couples who most likely are RV camping. The other group is predominantly younger families many tenting. This is a great festival for kids, with the playgrounds, mini-golf, fishing and even a pool. My wife and I have fallen into both of these groups. When our kids were still in elementary school, we started taking them with us to camp out at the festival. They thought of it as camping and swimming. They loved it. As the kids got older and we started to go to the bigger festivals, we stopped attending Gettysburg. Now, we are retired and find ourselves returning to Granite Hill for the festivals. The array of acts that perform at the Gettysburg Bluegrass Festival is excellent. The Seldom Scene has appeared at all 65 Gettysburg Bluegrass Festivals. Bill Monroe played on the Gettysburg stage many times including on his 70th birthday. The crowd size that day is still the all time record at Gettysburg. The Country Gentlemen played almost every festival until Charlie Waller’s death. Tony Rice has played in Gettysburg many times with the Tony Rice Unit, Bluegrass Album Band, Peter Rowan, and with Alison Krauss. Pete Wernick always comes to Gettysburg to put on his bluegrass jamming workshops and usually to perform with one of his ensembles. For the 66th festival in May, Pete is bringing in 70’s bluegrass phenoms, Hot Rize, with their sidekicks from the back of the bus, Red Knuckles and the Trailblazers. A few others who have played at Gettysburg include big acts like Sam Bush Band, Blue Highway, Gibson Brothers, Mountain Heart, Riders in the Sky, and Ricky Skaggs. A Dobro Summit was held at the festival in the early 90’s bringing together original Dobro master, Josh Graves, along with current legends Jerry Douglas and Mike Auldridge. The strangest thing I ever saw happen at Gettysburg was when Peter Rowan, Jerry Douglas, and Pete Wernick were concluding their late set playing a long version of ‘Navajo’ when the announcer pulled the plug on the show – literally. The sound went dead. It turns out the band was going over their scheduled end time (even though they were the last act of the night), and the announcer was strictly following the schedule (and apparently instructions from management). Peter Rowan did not return to Gettysburg for many years. I also saw John Starling drive his car right up the side of the stage, jump out and play with the Seldom Scene. And I will never ever forget the great John Duffy in his pajama pants telling silly jokes and talking to the crowd or teasing Joe and Lil about something from the stage. 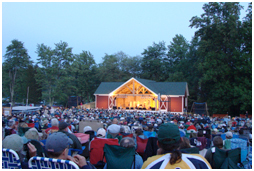 If you might like bluegrass, enjoy having access to the musicians, appreciate nice camping accommodations and don’t want the fuss of a large festival, you should consider going to the Spring (May) or Fall (August) Gettysburg Bluegrass Festival. It is a wonderful festival to attend to figure out whether you like acoustic music festivals. If you’re reading this, you probably already appreciate Americana music.